My most recent review for The Old Schoolhouse Magazine’s Review Crew is for Abraham’s Journey: A Celebration of the American Dream by Robert and Kathleen Basmadjian. From Inspiring the American Dream and published by Ambassador International, it’s “Finally, a Children’s Book that Celebrates THE AMERICAN DREAM!”. The book begins with Abraham in “the Great Recession”, hearing what, with the economy today, so many people are going through: his parents are laid off from their jobs and money is tight. Christmas gifts are out of the question. Abraham is determined to buy gifts for his family, but he doesn’t have any money for them either. Abraham texts his friends, and then “magic” happens. An older man strongly resembling Abraham Lincoln appears on his screen and pulls Abraham into another world that allows Abraham to meet many successful people in American history and here and now. They each have a lesson, a story, and encouragement for Abraham to realize his own American Dream. I had Liberty (age 9) read Abraham’s Journey and write a report on it. She enjoyed the book and had a lot to say about it (3 paragraph requirement turned into 3 pages from Liberty!) and learned a lot from it. As a family that’s not “technologically savvy” as some – and perhaps, most – some of it went over her head. There was still a lot to be gleaned from the story though, and it was well written and she understood the message. Perseverance, compassion, and sharing with others beyond the scope of his family were all themes of the story. These were well-communicated, and Liberty mentioned them in her report. Eden (age 8) picked up the book (if you knew Eden, you know I’d have had to tie her down to keep that from happening) and also read it. She really liked it. As a more outgoing child, she’s seen a bit more in the world of technology from others and I think that helped her understand what the story was talking about. I got a play-by-play of the story from her, and she was able to understand the story pretty well. She was really enthusiastic about it – more than Liberty. Liberty much prefers literature with a firm grasp on reality, but Eden was more appreciative the fanciful aspect. 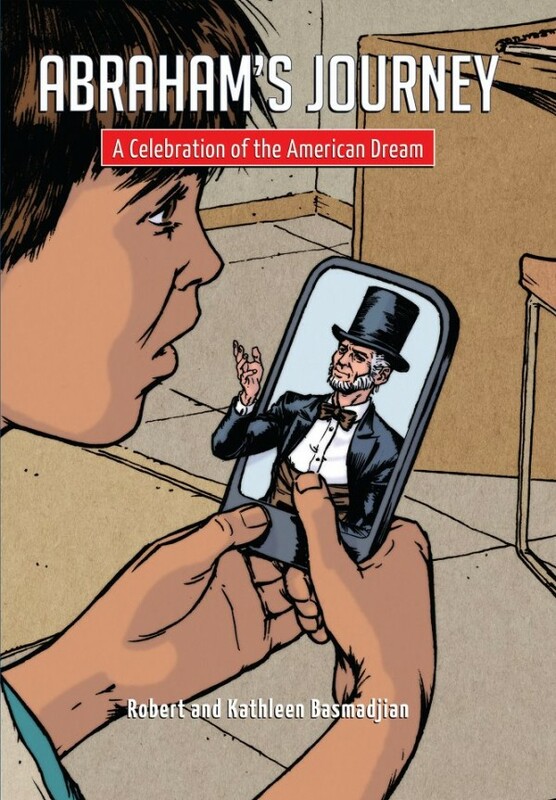 I think Abraham’s Journey would be a great book to read as the beginning of a unit study on the American Dream and what that really means, or as a beginning to a study on any of the people he “encounters” on his digital journey. At 40 pages, it quickly touches on Martin Luther King, Jr., Amelia Earhart, Bill and Melinda Gates, Mark Zuckerberg, Abraham Lincoln, and Norman Rockwell as a few famous Americans who have pursued their American Dream. From here, I’ve assigned each girl to pick one of the characters and learn more about them for an oral report with visual aids. I think it’s important for them to learn more about culture and what the phrase “American Dream” means, and the famous people – what made them famous and what they agree/disagree about the causes they each championed. Abraham’s Journey was a great place to start. Abraham’s Journey can be purchased at for $14.99. It was written for ages 7-12, but I think a few years younger and older than that can also benefit from reading it or hearing it read aloud. Click HERE to read more TOS Review Crew Reviews on Abraham’s Journey. Disclaimer: I received a free copy of this book through the Schoolhouse Review Crew in exchange for my honest review. I was not required to write a positive review nor was I compensated in any other way. All opinions expressed in this review are mine and my family’s. I am disclosing this in accordance with FTC regulations.